Each course was described in detail (and expert English) to us so that we could get the full history and reasoning behind every plate. We were served a handful of excellent sakes from different prefectures throughout the meal, with each change of sake yielding beautifully unique sake ware. The first course immerses you immediately into this wonderland by recalling the waffle sandwich, a popular frozen Japanese snack. 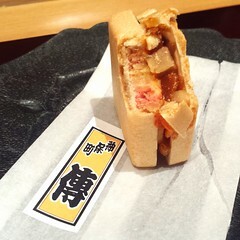 Here, its custom packaging is tear-ready, but instead of ice cream, the sandwich is filled with dried persimmons, pickled daikon and a delicacy to this Californian – foie gras. It was perfect parts pickling and richness, essentially heaven in my favorite realms of the palate. And then there was fresh Yuba, known as ever delicate bean curd sheets, cooked with milk and served up with lemon, dashi and potato starch on a bed of taro and topped with dried wasabi. Milky, starchy goodness – if you ever believed it possible to achieve all these things. 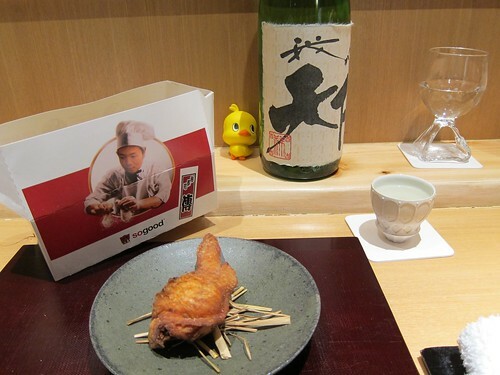 And then there’s Dentucky Fried Chicken, or DFC, which is presented with makeshift hay, a sponge yellow duck (Chef’s mascot) and a welcome greeting inside a doctored DFC box. Tomo, my gracious host and guide, tells me there have been many renditions of this chicken, but upon my visit the inspiration of Korean. Packed with pine nuts, ginseng, goji berries and black rice, my chicken was superbly crisp on the outside yet moist – with all its Samgyetang-influenced contents – on the inside. And then there were slices of Yellowtail, flash-boiled in dashi, and furnished with tobiko (flying fish roe) and tonburi (mountain caviar), with patches of broccoli sprout forests. Loved the vegetal accompaniments to the fish, and especially the textures and tastes from the varying roe. Hidden amongst 4 different kinds of dried and delicately pressed cabbage (take that, kale chips!) was a tender filet of Sawara (King Mackerel) in a seaweed sauce. Kohlrabi is pickled in dashi vinegar, deceptively taking center stage of the plate. 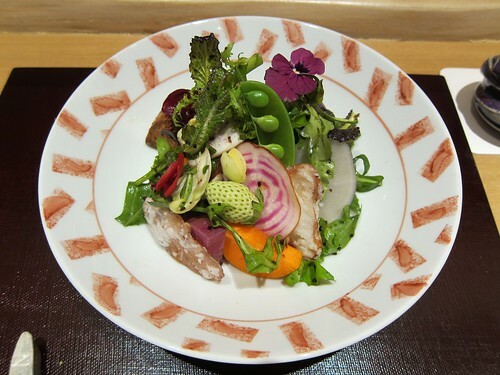 And then, there at the center of the meal, was a delightfully colorful salad with root vegetables and minimal dressing. (Of course there was salad). That was followed up by croquettes made of cod milt, milk and kuzu starch set in a dashi broth and a side of bottarga. Light and salty all at once. But like the rest of the meal, the finale of raw, marbled Sagagyu beef sheets over rice with bamboo and brushed with soy, katsu and kombu dashi was comfort food expertly interpreted with Chef Hasagawa’s unique sophistication. I never really had rice that heavenly. The true dessert finale, like the rest of the meal, owes as much to the imagination as it does taste. 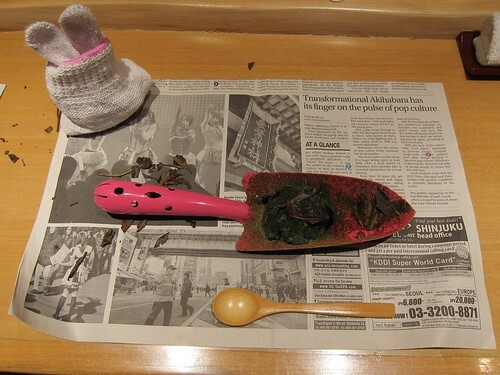 The dessert itself resembles dirt and is served as such with colorful garden shovels on top of newspaper and alongside a decorative garden glove folded into a bunny. The “moss” in his Moss Rock Garden Dessert is essentially matcha, the center mascarpone and pistachio creaminess. 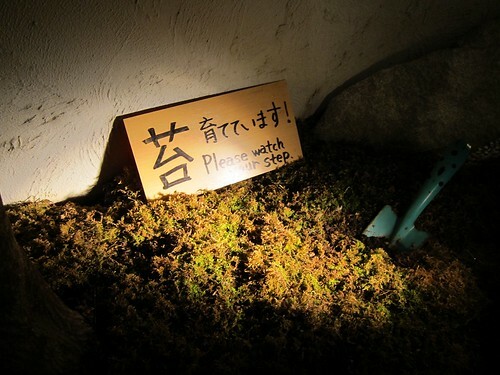 As you leave Den, you see it in his own garden next to its pathway, keeping chill in the winter air. 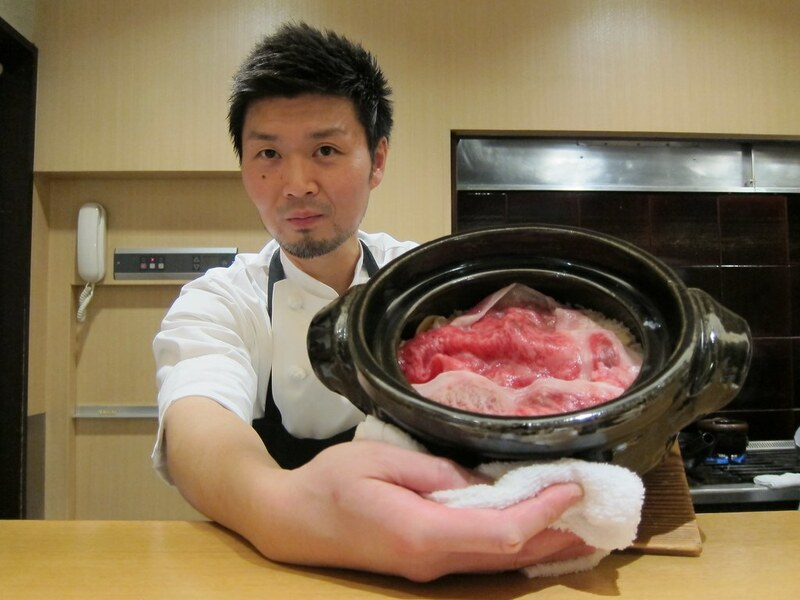 With sake, my 10-course experience with sake cost ~$175 USD. Also, my visit was in late February, so keep in mind courses change seasonally. 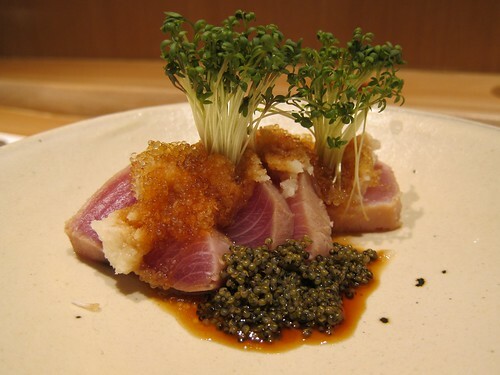 This entry was posted in Food, Japan, Prix Fixe, Sake, Travel and tagged #TravelTuesday, ??? 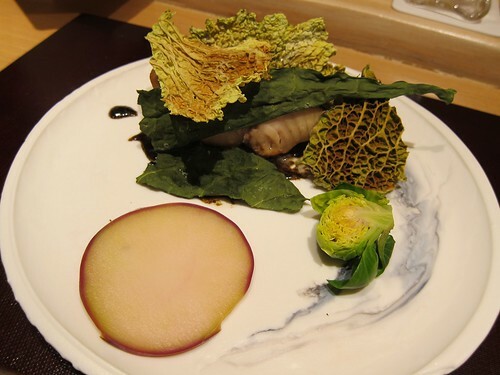 ?, Den, Jimbocho, kaiseki, prix fixe, restaurant, Tokyo, Zaiyu Hasegawa. Bookmark the permalink.